The weather warmed up enough to enjoy the outdoors without a coat. A whopping 65 degrees and without wind, what more could you ask for? And since around this time of year warm weather also means thunderstorms and rain, it was nice that there was sunshine. So one of my great friends, Marquecia, and I decided that we would block some time for brekkie — breakfast in Commonwealth-speak. I had been anticipating going all week, me with my Bill Cosby face like I am going to have a Jell-O pudding pop. Yep, it was off to Hasbrowns at 713 W. Maxwell Street in Chicago’s University Park so that we could get our fill. Filled to capacity, which seems to be commonplace with American breakfast shops in Chicago, Hashbrowns was as inviting as Marquecia had described it to me earlier. And I had planned to truly get stuffed right up until I hit a spoon accidentally and it tipped over my coffee that spilled on the thigh of the waitress. Then there was the chain of events. She backed up and bumped into the guy behind her who was sitting and he spit his coffee on his girlfriend. The girlfriend had pulled back her hand to smack her boyfriend and she knocked over a pitcher of water on the table next to her and the woman at that table stood abruptly, knocking over her chair and that caused the waiter who was carrying three plates of satisfaction to fall, the plates falling on the head of a fraternity boy and across the front of his sorority girlfriend. Meanwhile, people in downtown Chicago were running through the streets wildly because Godzilla was stomping on buildings in Tokyo. Wait. That does not make any sense and my imagination is a bit too overactive. So was my appetite. There was so much on the menu, but not exhaustively, and all of the options were tempting. Then I saw the portions on a few other tables and had a quick reality check. Marquecia and I started with tea, she having mint and I having orange. For our brekkie options, she ordered the big ole waffle that came with a dollop of whipped cream, cream, and a strawberry dip. 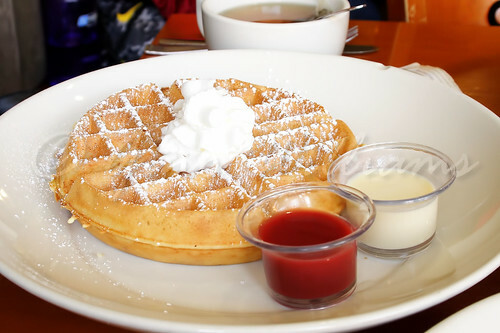 It was clear from the first bite that she took that the waffle was a plate of magic. Let me just say that it was not an Eggo waffle either. It was wonderfully huge! 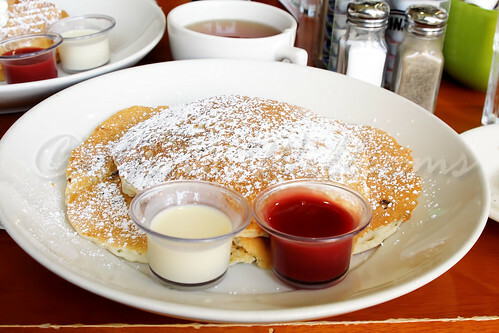 As for me and my out-of-control hunger, I had ordered chocolate chip pancakes that were out of this world and eggs scrambled with cream cheese. 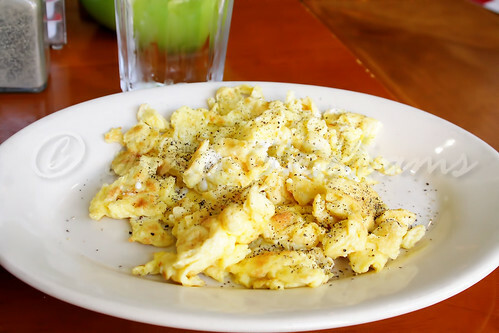 The waitress asked for the order on the scrambled eggs twice after my initial request. She had never heard anyone ordering eggs scrambled with cream cheese. I do not think the kitchen staff had ever had that kind of request either, no doubt accustomed to people wanting cheddar, Swiss, or American cheese in their scrambled eggs. Any woman sitting there watching my face would have known how to get to my heart. When the eggs came, I was smiling my signature stupid smile. They got it right. Not loaded up like Chip-Ahoy chocolate chip cookies — Betcha bite a chip — and not lacking in chocolate chips at the same time, the pancakes and their light, airy, fluffiness were super. With them being as colossal as they were, I actually had enough to pack for later but I worked my hunger magic and cleaned my plate. Marquecia was right about Hashbrowns’ breakfast being fantastic, not that I have ever doubted her recommendations. After we had finished, there was no more room for stuffing food. There was no way that either Marquecia or I was going to attempt to eat or drink more and induce eitus. Instead, we made plans to meet up for lunch another week so that we can sample another restaurant. Good space. Outstanding food. Excellent company. What more could you ask for? Well, that would be the check. And believe me when I say that a hearty breakfast at Hashbrowns for the price that you pay far exceeds going to any breakfast eatery with a drive-through attachment — or way of doing business. What I will say is that once summer really warms the temperatures, there will probably be people galore standing around to go in, put their feet under a table, and sink their teeth into some delight brought from the kitchen. I hope that in your haste to get some food satisfaction that you do not cause some accident that will result in a chain reaction of events ending with people running, screaming through the streets of Chicago because Godzilla is up to no good.